Ai Video: What would next-gen chatbots look like? Travel brands, including airlines, have been counting on chatbots to reshape the way travellers engage with them. There have been issues with the way chatbots have performed, especially in the realm of “reactive” response or simply responding to whatever a traveller is looking for. For instance, it isn’t uncommon to receive an email for completing an unfinished booking and being directed to a chatbot for further action. Say a user has already finished a hotel booking, reaches the chatbot interface, asks a question about a local activity in the destination chosen and the chatbot is seemingly unaware of the booking funnel! Ai’s Ritesh Gupta spoke to Jonathan Newman, Commercial Director at caravelo about the issues related to the performance of chatbots and how would the next-gen chatbots look like, considering that travellers expect communication in real-time and the expectations around human-like, voice bot conversation. Airlines need to be connecting user experience with conversion rate optimization, but this isn’t happening today because most airlines don’t understand the relationship between the two. "We are constantly seeing airlines spend 6 months to 1-year designing a new digital experience with an amazing digital agency, then they spend another year building this new digital experience, but by the time they have the new experience live it is 1-2 years old. This process can’t continue for airlines to be successful," says Mike Slone, Chief Experience Officer, Travelaer. According to Slone, airlines need to develop a “fail fast” attitude. One that allows them to quickly produce new innovative digital experiences, launch them, observe successes and failures, revise the user experience, observe and measure, and then optimize and redesign again - this should be a constant process, not one that is started every few years after you realize that your user experience is old and outdated. 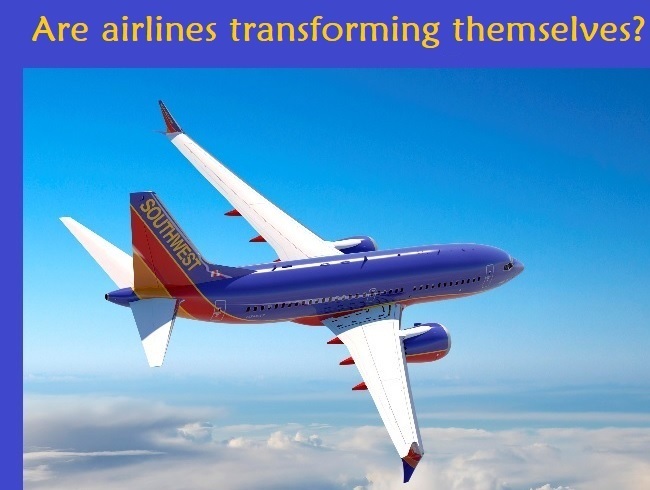 "Airlines are not agile enough and most are not willing to fail fast, thus they will always be behind until they change their internal processes to stay ahead of their customers," mentioned Slone. Talking of agility, if airlines are gearing up for digital transformation then adding UX to the initial phase of this journey is critical as far as crafting digital experiences is concerned. If digital transformation is about serving the passenger in an earnest manner, then how to ensure airlines keep pace with emerging tech such as wearables, VR etc.? At its core, UX is about creating ease of use. So being agile, being equipped to create compelling, relevant experiences across all touchpoints, devices etc. is must. And that's where the role of a UX design specialist comes in. Airlines need to transform their business - right from taking a call to becoming a "digital-first" business to defining roles within the organization to embrace agility. Focus needs to be on encouraging a culture of curiosity, learning and problem solving, while providing clear direction and support, this is exactly what Air New Zealand believes in as a carrier today. The team embarked on their digital journey a couple of years ago, and continues to look at designing digital experiences. And for these they recruit UX specialists. UX design calls for a cohesive effort, one where a cross-functional team collaborates frequently on design needs for product discovery and delivery. One challenge that airlines like most enterprises from other sectors face is a lack sufficient UX resources. Carriers such as Air New Zealand are showing the way, as they are counting on UX Designers to shape the future "faster". Organizations expect UX specialists to work in sync with others, for instance, with the product management team (often referred as the voice of an organization's customers). Working in an airline would entail crafting passenger-centric user journeys. A key part of their role, as stipulated by a job listing of one of the carriers, is to iteratively design products (via sketches, prototypes etc. ), work on visual design outputs as well as content design. Working out implementation guidance and control the quality of the product user interface. Experts point out that digital organizations are also looking at a layered user interface or UI framework that enables individuals with little or no design skills to rapidly bring together rich user experiences. User interface is termed as a collection of functional and visual patterns by which we perceive to be the UX of an application. How UX specialist support agility? As Slone pointed out, airlines are mostly followers, often only introducing functionality if the large tech companies have provided it and other airlines have already adopted it. This cycle of large tech providers not prioritizing investments in their booking engines and airline dependency on these providers has caused stagnation and lack of innovation in airline digital experiences. On the other hand, digital organizations follow a “fail fast” attitude, and by allowing UX specialists to be a part of a development team and bringing them early on in planning ensures they deliver what a user will need to see and when. Since the passenger would drive attributes within the domain model, featuring UX early on would pave way for precise delivery, cutting down on rework for developers. It is critical to set up an innovative development team, and airlines need to avoid as much rework for all team members as possible. This way airlines can experiment and test new offerings faster across their digital touchpoints. 1. Organizational structure: This aspect is often cited as major roadblock to being data-centric, be it for customer service or retailing. Airlines executives themselves are probing critical areas – is it time for airlines to split digital commerce from operations? Is an ecommerce/ digital business sitting under the same roof as operations curbing customer-centricity and data-driven retailing at airlines? Airlines need to take the quantum leap into the future, combating organizational/ cultural defiance, limitation of this industry’s legacy technology and operational silos. It is worth assessing how certain airlines with a decision to appoint a team of digital leaders are progressing at this juncture. The roles include responsibility for accelerating transformation, facilitating decision making through analytics, making the most of cloud services, how to make the most of user experience and product development teams, cutting down on the threat or even negating the impact of cybercrimes, data breaches etc. Of course, an airline’s business continuity is of high priority, irrespective of whatever is being planned. “Digital transformation goes really deep. It’s certainly not about assets, it’s not even about processes and methodologies. It’s about culture. The digital world brings significantly different complexity and speed as we are used to in the classical economy,” points out Marko Javornik, VP/GM Mobility and Travel, Comtrade Digital Services. Also, airlines need to move swiftly when it comes to refining of their digital assets. Kevin O’Shaughnessy, CEO and co-founder, Indigo.gt indicates businesses could explore the possibility of appointing a project manner, responsible for “getting something done quickly and get out of the door in an agile way”. This is an interesting approach to product development for the airline project manager. So consider the option of “microservices for your own project”, in addition to big IT projects and other approaches to IT set up, says O’Shaughnessy. 2. Platform economy model: How to be a part of any 3rd party ecosystem and enable passengers to complete a transaction or even service them? How to make the most of 1st party data and blend it with data platforms of 2nd party or 3rd party partners to serve the passenger in the best possible manner? This is where airlines can benefit most from the platform economy model, leveraging widely available data in the context of each consumer’s journey. In such model, personalization and speed have proven to underpin value creation. Platform economics rely on open models and one major benefit is coming to grips with unforeseen synergies with partners. “Say, a consumer regularly orders a fresh food item, a dessert via an online retailer, and this same item is available on a flight. Can it be served to the same consumer on a flight? “With data, connectivity and the ability to map data, anything is possible,” said a source. So airlines need to embrace open and accessible systems. This means that master data such as booking data, schedules, fares and profiles should be available for direct and real-time access for export to other systems and further it needs to be possible to update or enrich data by other third party systems. Certainly that is the job of IT vendors and travel tech teams are working on this with standardized XML technology, as explained recently by TravelSky Technology’s Lars Gaebler, Director - Marketing and Sales. Also, from IT perspective, airlines are evaluating the possibility of incorporating new processes, such as IATA’s One Order, in their IT set up to come up with a consistent experience across the booking funnel. One platform that’s a blend of both offer and order management, standing out for business intelligence, passenger identification module etc. for a seamless journey (being aware of the current flight, current order, servicing needs etc.). 3. Delivering digital experiences: Airlines need to be where their customers are, which means going to them and bringing the airline brand and experience to the customer. This means allowing the user to book a flight with an airline directly from any platform or digital device, for example if your customers are mostly on Facebook allow them to book the flight on Facebook, not try to convince them to visit a website, says Mike Slone, Chief Experience Officer, Travelaer. Also, airlines need to control the user interface and functionality on their digital experiences. The future of an airline’s digital success is building their own “best of breed” platform that can incorporate seamlessly the best travel tech products or modules into one experience, says Slone. Airlines also need to be spot on with their respective experience designs strategies. 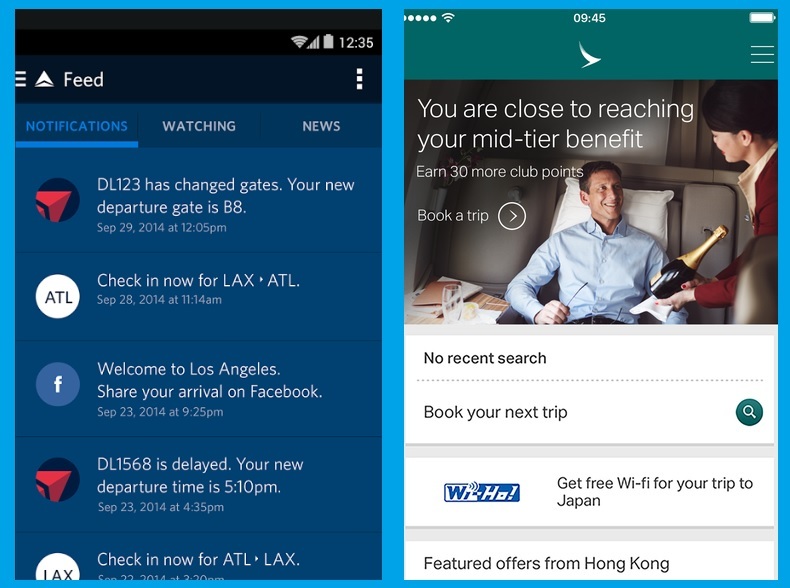 If we only refer to mobile, airlines still have a long way to go, be it for design for various platforms (operating systems work with unique conventions and standards), apt onboarding processes, evaluating the context of mobile interactions, etc. The capabilities of a smartphone, along with convergence of IoT sensors, be it for interacting with objects, voice search, augmented reality etc. need to be factored in and accordingly deliver relevant experiences. 4. Machine learning, AI and open APIs: Airlines not only need to collect and capitalize on the 1st part data within their organization, but they also apply machine learning to better comprehend the journey the passenger is taking. In addition to this, by embracing API-first approach, airlines can connect with developers, technology partners etc. Also, as airlines lend a new dimension to every interaction via chatbots, “digital humans” etc. they have a new touchpoint. On one hand, these assistants symbolize the core values of the organization they will represent but also they need to learn fast from a customer-facing role and make every interaction better. 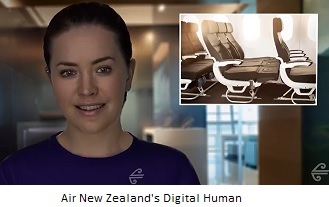 While a human computing engine, for instance, one introduced by Air New Zealand, thrives on emotional and artificial intelligence, is depicting emotional intelligence, organizations are also trying to count on facial coding or voice analytics in understanding how travellers feel or what their intent is. Say you choose to deal with a “digital human” and you are excited, you are in command. Even if this representative crosses the hurdle of answering basic questions that it is designed for, how about going deeper by blending bioanalytics in real-time and coming up with best possible answer in terms of making the most of the profile of the traveller (past history, preferences etc. ), backed by apt business rules for content, merchandising etc. The blend of artificial intelligence, cognitive computing and emotional data could well lend a new dimension to ascertaining how a traveller “feels” and accordingly delivering the best possible customer service or an ad or a digital experience. So there are new touchpoints, powered by AI, and there is new type of data (pertaining to travellers) that makes the puzzle more complex. 5. Being trustworthy: Even as airlines attempt to set up their respective core data assets, there is no scope for misuse of data. There is a need to be aware of registered consent when accessing customer data (so data coming from any touchpoint and system, the related computation or processing of data is to be done in sync with consent, assess how the data is being used, what data is being used and for how long that data can be used), address data audits in a speedy, exhaustive manner (say who has been accessing data) and ensure there is consent across all touchpoints (including integration with consent registration databases). The core data asset, say a customer data platform, needs to collect, manage, and store personal data responsibly. This is where the upcoming regulation, GDPR or General Data Protection Regulation, also comes in. Hear from airlines, digital marketing and travel tech specialists at the upcoming Ancillary Merchandising Conference, to be held in Edinburgh, Scotland this year (9-11 April, 2018). Ai Editorial: Airlines should rely on the booking engine to do its job - connect users with flights and allow them to book it - but not expect a booking engine to build, develop, and maintain relationships with their customers, asserts Travelaer’s Mike Slone. He shared 7 key facets related to Internet booking engines with Ai’s Ritesh Gupta. Airlines need to be in control of designing and setting up of the booking flow that they want, in sync with the digital retailing experience expected by today’s passengers. Besides being in command of the Internet booking engine, e-commerce specialists also need to factor other aspects, for instance, connecting user experience (UX) with conversion rate optimization. But are airlines excelling in this arena? Not really, asserts Mike Slone, Chief Experience Officer, Travelaer. As a specialist in this arena, Slone points out that the role of travel technology companies isn’t just about selling an IBE. “Airlines need to control the user interface and functionality on their digital experiences and often to do this they will need full control of their IBE, which most do not have today. The future of travel tech companies like Travelaer, should be to assist and enable an airline digital team with their IBE, not provide them with an IBE. There is a difference. At Travelaer, we are producing tools in a modular format via API or UI (user interface) that will enhance the user experience for an airline, but we don’t always expect them to adopt our entire IBE,” said Slone. 1. Being a laggard: Airlines tend to be followers. They tend to introduce a new functionality if large tech companies provide it and other airlines have adopted it. This cycle of large tech providers not prioritizing investments in their respective booking engines and airline dependency on these providers has caused stagnation and lack of innovation in airline digital experiences. “A very clear indicator of the lack of innovation or evolution with IBE’s is to look at the booking or search widget found on every airline site. If you go back to 1995 and look at the first airline IBE, Alaska Airlines, you will see very little evolution 28 years later. Airlines are still using the same version of HTML form elements that were found on that site, still today. The form elements may visually look a little better today, but if you compare searching and booking a flight from 1995 to 2018, the structure and functionality is still the same. You’ve seen some new thinking and small innovations on sites like Virgin America, but the main tool for searching flights is 99% the same as it was in the late 90’s,” explained Slone. 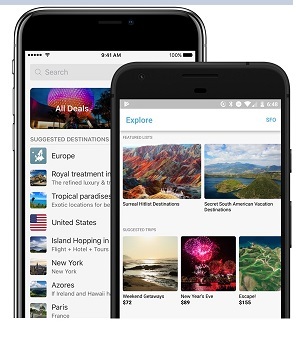 He added that when one compares the user experiences of an online travel agent site like Expedia to an airline site, the features and functionality found on the OTA sites and apps are often several years ahead of the airlines, if not beyond that. “For example, take responsive user interfaces and mobile applications- OTA’s and meta-search sites like Expedia and Skyscanner have had a responsive user interface for years, whereas most airlines today still don’t have responsive user interfaces, much less iOS and Android mobile applications,” he said. 4. In-house digital teams at airlines: Slone highlighted that most of the evolutions in airline websites are not coming from the IBE, but rather the user interfaces and products developed around the IBE to surpass their limitations. These innovations are being spearheaded by the airlines themselves and very rarely the large tech company providing the IBE. “We’ve seen this in our customers like Icelandair and Finnair who have built their own digital teams in-house. They are following the lead of companies like Ryanair and EasyJet (these airlines have set up large UX and development teams in-house that design and build their IBE’s).” He added that airlines are starting to see the importance of expanding the types of products they can sell beyond one-way and round-trip and they have realized that creating digital systems to make online booking easier will help them add more revenue. If any investment is going into IBE’s it is allowing airlines to sell complimentary products better such as ancillaries. 5. New functionalities: Airlines have been working on simplification of platforms, introducing options for booking complex stopover itineraries, enabling accessing of a shopping cart from different devices etc. Considering the significance of stop-over for Icelandair, the team at Travelaer developed a new type of booking widget that would take the complex multi-city format needed for stop-over bookings and make it user friendly and simple. The team chose to combine a mapping element connected to the booking widget to display the customer itinerary and timeline on the map, so that users could visualize what they were booking before they ever left the booking widget. “We also knew that one of the top user errors were linked to flight availability and the customer choice of dates from the calendar, so we solved this problem by connecting pricing and availability directly to the calendar, which didn’t allow a customer to choose date in which there were no available flights. We further simplified the experience for the user by asking them questions about stop-over instead of them having to fill out numerous forms. These simple UI and functionality changes made a huge difference for Icelandair. The airline saw their stop-over bookings online dramatically increase after we launched the stop-over booking widget and engine,” said Slone. 7. Preparing for the future: The future of an airline’s digital success is building their own “best of breed” platform that can incorporate seamlessly the best travel tech products or modules into one experience, said Slone. “Relying on one IBE or one travel tech partner is often a mistake because the airline is held back by the abilities of one provider, when they could be advancing by working with multiple providers. Some airlines will always want the “easy button,” but the innovative airlines will push beyond the spoon feeding that happens from the large travel tech providers,” he said. “For most airlines, their focus should be less about their IBE and more about what happens after an air booking – “Manage Trip” and online check-in are the best places to develop a great relationship with customers as well as increase revenue from them who booked with an OTA.” He also added that carriers need to be connecting user experience with conversion rate optimization, but this isn’t happening today because most airlines don’t understand the relationship between the two. Plus, airlines need to develop a “fail fast” attitude. One that allows them to quickly produce new innovative digital experiences. Hear from experts at the upcoming Ancillary Merchandising Conference, to be held in Edinburgh, Scotland this year (9-11 April, 2018). Expectations of a traveller when they shop or travel with an airline revolve around value exchange and trust, and even saving on time especially considering that planning a trip can be a laborious task. This isn’t really new when we talk of what typically a consumer would look from any product category. But meeting such expectations isn’t easy in today’s era where brands are trying to make the of every data trail that a traveller leaves behind or how they are embracing technology. As underlined by OpenJaw, businesses have to transform themselves in order to thrive in the digital age. Transitioning into a digital organization: Air New Zealand has evolved as an enterprise. Their transformation process started in 2015. The team acknowledges the fact that there is a team of digital leaders with diverse backgrounds and skills. The roles include responsibility for accelerating transformation, facilitating decision making through analytics, making the most of cloud services, how to make the most of user experience and product development teams, cutting down on the threat or even negating the impact of cybercrimes, data breaches etc. In one of our recent interviews, Kevin O’Shaughnessy, CEO and co-founder, Indigo.gt acknowledged that there is a lot of pressure on airlines to deliver new experiences to passengers. For instance, if an airline intends to target a traveller with an ancillary product then it would need to gear up for the real-time delivery of content as per the phase of the journey of the traveller, the device being used, purchase history plus clicks related to the latest transaction (or even cart abandonment) if any that indicated interest in an ancillary offering etc. So who would be responsible for making the most of personal data? How to ensure the custom integration work is in place in case of a headless architecture since the front-end and the back-end are disconnected (otherwise personalized content won’t be possible) etc. There is a need to define new roles to capitalize on the journey of digital transformation. Understanding the utility of cloud, APIs, microservices etc. : Being agile and being open to testing and experimentation without impacting business continuity is a critical aspect for airlines as the likes of full-service carriers have always been process-centric. The utility of microservices comes to the fore when businesses consider synergy in the application development process. The strength lies in breaking applications into smaller, independent services that are not dependent upon a specific coding language. This way airlines or travel e-commerce end up having more flexibility over operations and deployments. When it comes to changing the way purchasing flow works or the check-in process, these tend to be relatively big IT projects. But when it comes to aspects like microservices, O’Shaughnessy contemplates the possibility of appointing a project manner, responsible for “getting something done quickly and get out of the door in an agile way”. In a positive development, proactive airlines are embracing an open-first culture within their development teams. This underlines the fact latest capabilities are deliberated first with a perspective that any member/ team could potentially use them. Attaining customer-centricity with responsibility: If on one hand airlines have been building on a core data asset with a perspective that if a company can’t access their own customer data, airlines can’t even get close to attaining customer-centricity, then on the other they also need to respect privacy, too. In fact, it is being pointed out that developments such as General Data Protection Regulation or GDPR (coming into force in Europe on 25th May this year) are also resulting in a meaningful digital transformation. There is no scope for companies that mishandle/ misuse data. Also, rather than considering security and customer experience separately, this development paves way for a more holistic view of the customer experience. As we highlighted in one of our recent articles, there is a need to be aware of registered consent when accessing customer data (so data coming from any touchpoint and system, the related computation or processing of data is to be done in sync with consent, assess how the data is being used, what data is being used and for how long that data can be used), address data audits in a speedy, exhaustive manner (say who has been accessing data) and ensure there is consent across all touchpoints (including integration with consent registration databases). The core data asset, say a customer data platform, needs to collect, manage, and store personal data responsibly. Omni-channel shopping and servicing: There is plenty to look forward to in this arena as to how a core data asset blends with core airline systems/ engines. How can airlines bank on business rules and control content for each customer to get closer to personalization? How to ensure new processes, such as IATA’s One Order, can be incorporated into an airline’s IT set up to come up with a consistent experience across the booking funnel? There are lots of interesting developments in this arena. Airlines are being pushed to expect a lot more their respective PSSs, especially full-service carriers. There is a need to opt for a platform that’s a blend of both offer and order management, standing out for business intelligence, passenger identification module etc. for a seamless journey (being aware of the current flight, current order, servicing needs etc.). Whether this platform becomes a part of a PSS or works alongside it, a master record would serve the travellers best, be it for shopping or servicing. Hear from experts about digital transformation at the upcoming Ancillary Merchandising Conference, to be held in Edinburgh, Scotland this year (9-11 April, 2018). Ai Editorial: Converting PNRs into “Orders”, possible to do within the PSS? Over a period of time certain processes were created for running airlines and as a result, the industry today is run by complex processes. For example, order and payment processes don’t tend to feature in the same systems. Carriers have two distinct ways for identifying the same transaction: the PNR (the order, used for operations and fulfilment) and the electronic ticket, a confirmation of the payment mechanism. As Triometric also explained in one of their blog postings, different legacy systems – an operation’s (reservations) system and a financial (payments) system – are still being separately maintained. Today much of the data in PNRs and ETs is replicated, as there are two distinct processes, airlines end up performing a reconciliation process in the back office. And what if an ancillary offering is bought direct whereas the air ticket was purchased through an intermediary! Hopefully these processes are going to be simplified in the future. One area that is being looked at is refining of the order management process, through the concept of a single customer order record. According to the IATA, this would capture all data elements obtained and required for order fulfillment of air travel. The plan is to do away with multiple reservation records as well as e-ticket/EMD concepts to be replaced by a single reference travel document. So the plan is to work out one simplified and standardized order management process. So how do the emerging One Order Management and Offer Management systems/ platforms work with the existing technology? Those technology companies that don’t own the PSS have been working on a platform that’s a blend of both offer and order management, standing out for business intelligence, passenger identification module etc. for a seamless journey (being aware of the current flight, current order, servicing needs etc.). It would also mean that the platform, running in parallel to an airline’s PSS, would feature complete PSS booking connectivity and document process capability, converting PNR into “orders”. So PSS would pass on information to the NDC platform, where master record would be stored. The blend counts on historical details provided by the order management system and this vital, real-time business intelligence is leveraged in personalisation of offers. But what about converting PNR into “orders” within the PSS, is it possible? “In case of a PNR-based system that has been around for three decades or more, it is going be very hard to do the same within the system. In case relatively new architectures are involved, then the same can be streamlined much faster,” mentioned a source. New offerings are being planned. The recent launch of TravelSky Technology’s QUICK Passenger Retailing System (PRS), a hybrid system that encompasses features from a traditional Passenger Service Solution (PSS) and blends them with e-commerce tools is a tactic to capitalize on the emerging opportunity of retailing. This system has been created from the beginning, and at a time when NDC and OneOrder are gaining prominence, according to Lars Gaebler, Director - Marketing and Sales QUICK PRS, TravelSky Technology. The new launch, one that has been in making for two years, has been worked out for medium- and small-sized carriers. The QUICK PRS is ready to move away from traditional passenger name records, electronic tickets etc. and similarly, it features XML API based on NDC. “Our system considers orders rather than e-tickets,” says Gaebler. How are the likes of Amadeus, Sabre, Travelport, TravelSky, Farelogix, Datalex, JR Technologies, OpenJaw Technologies, IBS Software etc. gearing up for new processes and accordingly shaping up their offerings? Hear from experts at the upcoming Ancillary Merchandising Conference, to be held in Edinburgh, Scotland this year (9-11 April, 2018). It’s pulsating to assess how the ever-improving statistical, data-driven systems and algorithms to interpret patterns in data sets can shape the future of every interaction, every experience with travellers. Considering the fact AI and machine learning demand substantial time and proficiency to get going, airlines need to lay a solid foundation for their respective data strategies. But that doesn’t tend to be the case with this industry. “Airlines (over the years) have largely focused on safety and operations, running their operations. Even as certain carriers have made progress with their data strategy to refine their merchandising, customer service etc., typically in case of mid-size airlines they still “don’t know who their customers are”,” points out Binay Warrier, Head of Business Development, Loyalty & CRM, IBS Software Services. And among those who initiate data-driven decision-making, “some operate a basic CRM to support their marketing function”. “One issue that has been with airlines is usage of different systems for booking data, at the airport (such as departure control system) etc. So, if interactions happen at the airport or transactions take place, or even data is available based on the in-flight experience, all of this is disjointed, doesn’t give one picture of the traveller. If one were to assess the airline purchase journey, there is shopping around not just fares – but also destination, scheduling, air- and non-ancillaries etc. The booking window varies considering leisure and business travel. Airlines are in a unique position where they hold a relationship in a transaction for the lengthiest amount of time,” said Warrier. As it turns out, there is an opportunity to communicate, right from dreaming to booking to consumption of the product to the post-travel era. 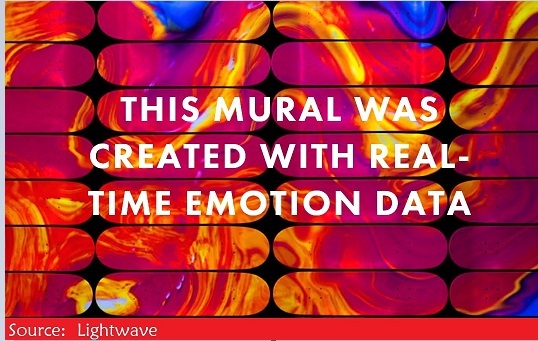 And this can be meaningful only if data is captured, pooled, processed, analyzed, visualized and action is taken in methodical way, and for that a data platform is must. The ultimate goal is to bring together multiple identifiers and connect them to work out a unique traveller profile. Preparation: Readiness is an issue, as availability of data doesn’t mean that it would result in insights. “In case of carriers that have been around for a while, it is not easy to embark on a data strategy by leveraging an available platform. The way they (airlines) are handling data today it is not easy to take information out of that, process it, store it in a way for serving a future purpose/ running analytics on that. That’s an important aspect, plus can be a costly affair too. So that’s where data cleansing, deduplication, integration, pool management etc. comes into play. Also, a gap analysis or missing pieces of action needs to be factored in,” mentioned Warrier. It is also asserted that an organization needs to be ready for issues around data quality, metadata management, access, sharing, ownership, security etc. This also needs to be considered along with data strategy plan, change management, execution, testing and learning, and measurement metrics etc. Critical questions that need to be answered include data ownership, ascertaining the quality of data, refining of data architecture etc. Capturing data: The sum of all interactions/ requests can only be incorporated in a profile if data is captured. An airline needs to unify data from several sources – CRM, from staff/ call centre interactions, booking flow metrics, purchase data, from social applications etc. “Profile data, transactional data, mobile and social data – these are basic requirements for setting up a profile,” mentioned Warrier. Today’s data platforms are capable of storing data from any internal or external source, as well as unstructured data. Overall, airlines should be able to integrate, cleanse, standardize and dedupe data to create a single view of the traveller by merging all of the available online and offline data. As we highlighted in our article earlier this week, JetBlue today is able to aggregate a single view of the customer (on service channels). So all interactions (say featuring a JetBlue account on Whatsapp, Facebook Messenger, Instagram etc. or an interaction at the airport or with a call centre executive) are captured and aggregated into a single conversational view of a customer. If a conversation takes place between passenger at the airport and the airline staff, then how about analyzing the same without any privacy issues? Today, as IBM asserts, technology is in place to “capture the audio of the conversations and run speech-to-text and tone analysis directly on the device, thus completely avoiding sending any sensitive data to the cloud”. Essentially what is being done is “tone analysis” and this can be equated with attributes like happiness, sadness or anger. Such insights can go a long way in coming up with a relevant recommendation when the passenger interacts or attempts a booking next time. Working on data: Cleanliness of the available data would decide the efficacy of the whole exercise, with key to same being cutting down on the size of the data set and paving way for algorithms to examine the same. Other areas include refining the integrity of the data as well as doing away with irrelevant/ pointless information, which is part of transformation. “De-duping, cleansing is fundamental to identify the unique customer (find missing and inaccurate parts of the information) are the main starting steps…you may run algorithms or even incentivize the customer to share correct information,” mentioned Warrier. And then curation is equally important. So it could be about blending – demographic information, online behavior (website visit, purchase etc. 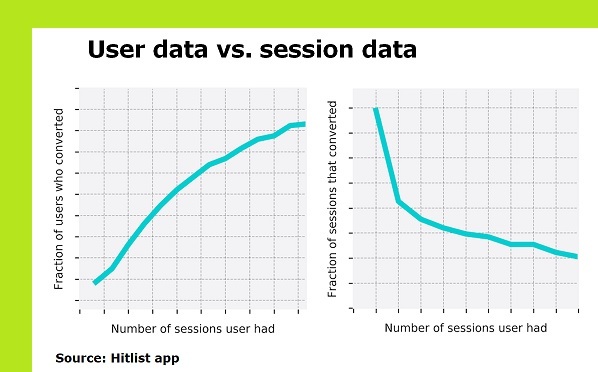 ), in-app behavior (sessions, last opened etc. ), email interactions, social media activity and offline interactions. A core objective is to assess the flow of travellers and that data across their journey. This way an airline can evaluate where internal or technological silos may exist that affect the passenger experience. Deploy algorithmic audience modeling capabilities to capitalize on what an organization knows about their most valuable audience segments and rely on the same to discover new audiences with the same potential value. Use data-driven marketing tools like cross-channel analytics, predictive analytics, and advanced personalization to shape up desired customer experiences. Hear from experts about data strategy and making the most of AI and ML at the upcoming Ancillary Merchandising Conference, to be held in Edinburgh, Scotland this year (9-11 April, 2018). Ai Video: How can airlines embrace "digital agility"? Airlines, like any organization that is vying to make every customer interaction a meaningful one, have to ensure they gear up for digital transformation in an earnest manner. One of the challenges that a process-centric business like running an airline often face is how to deal with change. This includes streamlining of the organizational structure i. e. how various work roles and responsibilities are delegated, controlled and coordinated as well as making the most of microservices application architecture, APIs etc. So how can airlines refine their processes or digital assets, most specifically the ones that deal with passenger journeys? How to go about accepting payments via a new alternative payment method - for instance, testing WeChat or Alipay payment options with the elite members of an airline. “There is a lot of pressure on airlines to deliver new experiences to passengers,” acknowledges Kevin O’Shaughnessy, CEO and co-founder, Indigo.gt. So there is a constant need to evaluate mobile interfaces, web interfaces, and even service touchpoints. In this context, there is reference to “microservices”, an approach under which applications are broken down into smaller, independent services, that are not dependent upon a specific coding language. Eventually there is synergy in the application development process. This airlines or travel e-commerce end up having more flexibility over operations and deployments. When it comes to changing the way purchasing flow works or the check-in process, these tend to be relatively big IT projects. But when it comes to aspects like microservices, O’Shaughnessy contemplates the possibility of appointing a project manner, responsible for “getting something done quickly and get out of the door in an agile way”. This is an interesting approach to product development for the airline project manager. So consider the option of “microservices for your own project”, in addition to big IT projects and other approaches to IT set up, he added. “In case of a quick (and a fairly smaller) project, one could possibly turn to microservices (so typically a case of a software development for one service, might be an API or plug into something else) and chances the airline IT team already using associated services. So it could be about finding a way to running an experiment quickly,” explained O’Shaughnessy. Hear from experts about optimising digital assets at the upcoming Ancillary Merchandising Conference, to be held in Edinburgh, Scotland this year (9-11 April, 2018). Ai Editorial: How to support digital assets for them to be “real” assets? Airline-owned digital assets need to keep pace with the latest advancements, varying from relying on artificial intelligence to automate personalization to contextual delivery of content to embracing agility for product development. Flexibility over operations and deployments: “There is a lot of pressure on airlines to deliver new experiences to passengers,” acknowledges Kevin O’Shaughnessy, CEO and co-founder, Indigo.gt. So there is a constant need to evaluate mobile interfaces, web interfaces, and even service touchpoints. In this context, there is reference to “microservices”, termed as an advancement of the service-oriented architecture design. In this case there is one complicated application that is divided into smaller bits that are simpler to develop and test against. Each microservice has a self-contained set of functional duties and easier to support. Thus airlines or travel e-commerce end up having more flexibility over operations and deployments. When it comes to changing the way purchasing flow or the check-in process works, these tend to be relatively big IT projects. But when it comes to aspects like microservices, O’Shaughnessy contemplates the possibility of appointing a project manner, responsible for “getting something done quickly and get out of the door in an agile way”. This is an interesting approach to product development for the airline project manager. So consider the option of “microservices for your own project”, in addition to big IT projects and other approaches to IT set up, he added. “In case of a quick (and a fairly smaller) project, one could possibly turn to microservices (so typically a case of a software development for one service, might be an API or plug into something else) and chances are that the airline IT team would already be using associated services. So it could be about finding a way to running an experiment quickly,” explained O’Shaughnessy. Of course, the big picture doesn’t change, but this methodology brings in agility to embracing new concepts – for instance, testing WeChat or Alipay payment options with the elite members of an airline. The role of application programming interface (APIs) in formulating flexible ecommerce architecture can’t be understated. Talking of mobile or web interfaces, increasingly there is focus on decoupling the front-end user interface of the ecommerce storefront from the main commerce offering. Such methodology ensures quicker crafting of experiences that upkeep with various platforms and devices or chip in with new travel products. As for moving infrastructure into the cloud, it is time to leverage today’s technology at a much lower cost, and avail the benefit of scaling it up. Airlines consider factors such as such as security (the role of technologies such as encryption and tokenisation comes into the picture) as well as connecting legacy applications to the cloud at enterprise scale. Experience optimization: Capabilities of the content management system available today is one area that needs to be factored in, first with the proliferation of different devices that didn’t use HTML and also with the Internet of Things. But the delivery of content as per the device being used is just one aspect. E-commerce players also need to able to create and edit content in context, and pave way for personalized experiences. The customer experience ends up being decoupled as well. This would limit the ability to personalize the overall experience. As highlighted in a previous article, there is a balancing act that needs to be managed, when there is consideration of headless or coupled. Of course, with a headless content management system, one can create and store content that is device agnostic. On the contrary, as Sitecore points out, “what-you-see-is-what-you-get” capabilities that let users create and edit content in context aren’t there with headless. Since personalisation calls for gathering and study of user interaction data from the front-end in order to optimise personalised experiences from the back-end, it requires loads of custom integration work in a headless architecture since the front-end and the back-end are disconnected. Content management, be it for going for an architecture that supports delivery of content for emerging technologies and all devices, or adopting personalisation rules that tailor a site content based on visitors’ profiles is one key area that is demanding action in a swift manner. So when it comes to a headless content management system, Sitecore asserts that such architecture should be used by “digitally mature” entities that are capable of managing “customer experiences in context of how users interact with your brand”. Further adds, it should work for those “whose digital properties are personalized, who regularly test and optimize those experiences, and whose organizations are set up to be customer-centric.” Then only one should expect to manage the balance between contextualized digital experiences and standout app user interfaces. Counting on machine learning: The application of machine learning in managing e-commerce fraud is coming to the core. The issue of fraud or account takeover can also hamper the user experience. As much as consumers experiment and embrace new forms of payment options, each new technological development introduces new avenues for fraud, meaning detection and prevention efforts need to be just as agile. Many fraud prevention methods introduce dilemmas between maximising revenue and minimising fraud – e.g. with more rules, implementation of 2FA or multifactor authentication fraud rates can be lowered, yet more genuine customers will be blocked; on the other hand, with less rules and lax authentication to maximize revenue, merchants will be more vulnerable to fraud attacks. Companies can defend themselves adequately by using a tool like machine learning, and at the same time there needs to be reliance on rules and the human component (intervention and feedback) as well. The power of machine learning is still in the supervised state as of today. Typically, the supervised machine learning technique focuses on a cycle of training, predicting, and acting stages. Of course, airlines need to look around data quality and data volume in terms of how clean that is to capitalize on machine learning. Once a virtuous data pipeline is in place, it can be built upon with machine learning models, with rules, and create tools to help the team analyze problem areas such as account takeover.